Take the helm or just sit back and relax. Enjoy a day sail to Mustique, the island of the rich and famous, or visit the uninhabited island of Isle de Quatre with its crystal clear waters, great for snorkeling. Sail with Nicki and Cristina on longer charters throughout the Grenadines and lower Caribbean. Visit Canouan, Mayreau, Union, Palm, Petite St. Vincent and the beautiful Tobago Cays. Let us help you design your own charter. We also offer longer trips to Carriacou and Grenada. English and Spanish spoken. While sailing keep a sharp eye out for whales, dolphins, and turtles, whose sightings have thrilled many of our guests. 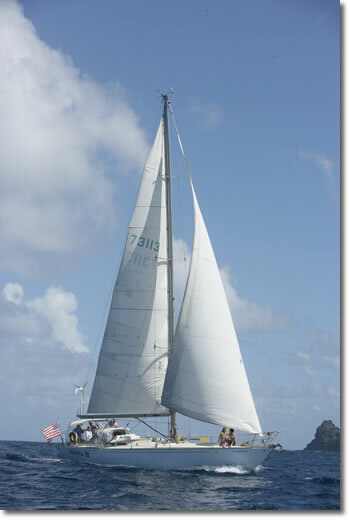 Sail with us for a few hours or tour the Windward Islands for a week or more aboard our racing bred 44 ft. C&C. We are also the proprietors of Caribbean Link Yacht Charter and Service. Contact us for your yacht maintenance needs. Capt. 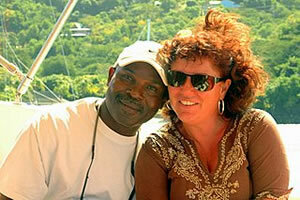 Nicki Hazell is from a sailing family and is a native of Bequia. He's been sailing his whole life and knows the waters of the Grenadines like his own back yard... because it is! Cristina is from Spain and spends her winters in Bequia. She has spent many years working in the European tourism industry. Christina is also an excellent cook, experience her Caribbean cuisine prepared with a European flair. St. Vincent and the Grenadines W.I. Copyright © , Red Mountain Web Specialties, All rights reserved.